Freshwater planarians are able to regenerate a new individual from a tiny fragment of its own body, no matter whether that fragment comes from its head, trunk, or its tail. The minimum fragment size is as small as 1/279th of a planarian according to the findings of T. H. Morgan (1898), equivalent to approximately 1x104 cells according to Montgomery and Coward (1974). The tremendous regenerative capacity of these animals has made them a favored organism for the study of the mechanisms underlying pattern restoration for more than two centuries. What makes planarians so plastic? All planarian organs are embedded in a mesodermal tissue called parenchyma, which consists of several non-proliferating cell types and only one mitotically active cell type, the neoblast. Neoblasts are adult stem cells, which account for approximately 15%–25% of all parenchymal cells and include pluripotent stem cells (cNeoblasts). The proliferative capacity and pluripotency of these stem cells underlies the extreme tissue plasticity in planarians. The first image displays in green the digestive and excretory epithelium stained with anti-beta-catenin2 antibody and in red the photoreceptor cells and optic chiasm stained with VC-1 antibody. The second image displays in green the stem cell compartment as shown by in situ hybridization for Smedwi-1. The high magnification box of the head region was stained also for a stem cell epithelial progeny marker (Smed-Agat-1; magenta colour) and for anti-phosphorylated-histone3 (yellow). The asterisks show the position of the eyes. The process of planarian regeneration itself is special since following injury planarians can completely regenerate all the missing structures in about 7 days. After 7 days, the planarian still has to completely finish the rescaling or remodeling of its body to regain the correct proportions. Our lab is interested in understanding how stem cells are regulated in order to allow regeneration to occur. 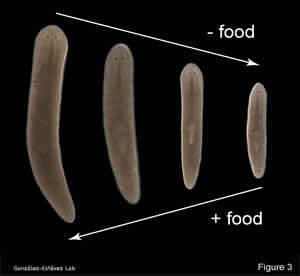 Most planarians tolerate long periods of starvation, and during this time they shrink from an adult size to, and sometimes beyond, the initial size at hatching. First, food reserves from the gastrodermis and parenchyma are used up and later testis, copulatory organs and ovaries get digested. More surprisingly, when food is given to shrunken individuals, they grow again to adult size and all the reproductive structures appear again. This process may alternate back and forth for long periods without apparent impairment of the individual or to its future maturing and breeding capacities. Amazingly during this time they are able to maintain a stable population of stem cells. Growing/degrowing is a continuous process in planarian life and thus there is a continuous rescaling and re-patterning of their bodies. This means that planarians should have a very precise regulation of stem cells during these processes. Growth and de-growth in planarians when starving. 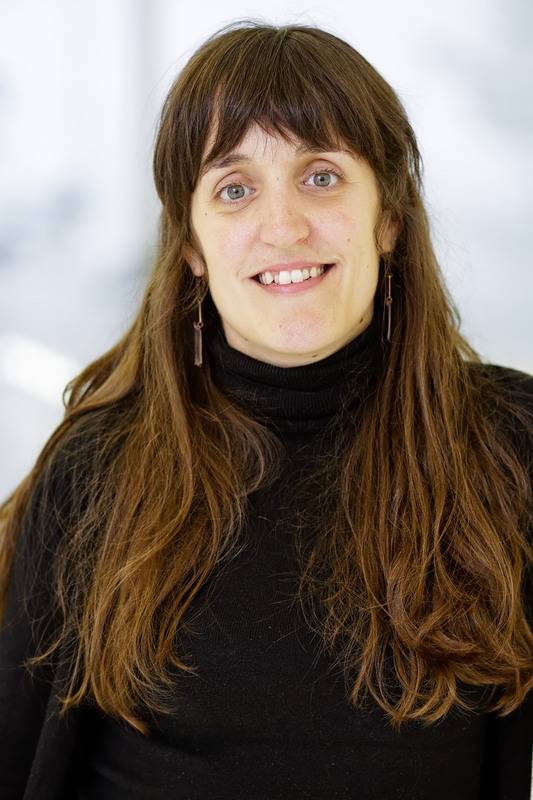 We are especially interested in understanding how the process of starvation regulates stem cells. In old literature there are several indications that planarians have an increased potential to regenerate when they are starved. Since it has been suggested that the effects of caloric restriction delaying aging in many organisms are at least in part due to an enhancement in stem cell function, it will be very interesting to explore whether this is also the case for planarian starvation.